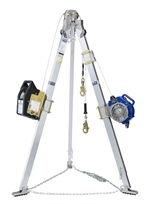 9 ft. (2.7 m) aluminum tripod, 60 ft. (18 m) Salalift II winch and 50 ft. (15m) Sealed-Blok 3-way SRL with stainless cable, mounting brackets, carrying bags and leg mount pulley. Standards ANSI Z359.14, ANSI Z117.1, OSHA 1910.66, OSHA 1910.146, OSHA 1926.502, Capital Safety Gen. Mfg. Req.